Good Chinese, Indian and other Asian food is known to be sourced from the dirtiest, rudest hole-in-the-wall shops around town – especially east of our Metropolis off the 10 and 60 freeways. I can put it this way:Â There were plenty of great reasons to visit my aunt who lived in West Covina for those two years, and they were all within a two-mile radius around the house she later flipped. There’s usually a direct relationship between taste and MSG in Asian food, however. It’s just one of those known facts, along with the cost-effectiveness of an often cash-only operation – and a lot of these Mom and Pop shops using styrofoam and other unrecyclable products and just plain being un-green. 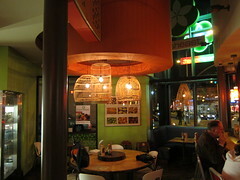 Fresheast is the first known-to-me Pan-Asian place that integrates an Eco-conscientious (organic when they can) business model into actually delicious food. No MSG is in their recipes, all their sauces are made in-house and their plates are made from recycled, bio-degradable palm fronds. As for your side, you can choose from white rice, brown rice, quinoa or greens. The best part of all of this is that they’re Midtown Lunch LA price point-friendly (that is, under $10). To start, anyway (sorry, Zach, you’ll have to drink water). They also have beer and wine on their menu, so you can wash down your Jidori Chicken with some Singha or Fess Parker Pinot Noir. And there’s free parking. In West Hollywood. And there’s energy outlets! And wifi! Talk about blogger-friendly. My favorite dish was definitely the Emperor’s Lamb, which really impressed me in that there was little-to-no gamey taste. 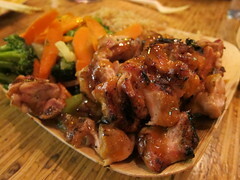 Their Jidori Chicken was also solid and had really good flavor. 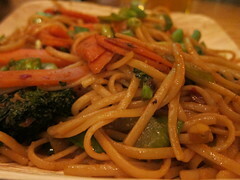 The Spicy Garlic Noodles were so-so, butÂ nothing extraordinary. It seems that for the most part, they’ve been able to hone in on the right recipes, creating dishes that utilize fresh andÂ made-in-houseÂ ingredients while keeping the price point fairly low. I also loved the Fresheast juice, which was a great, natural energy drink made with beets, kale, apples and other ingredients. Feel like coconut? They got them. And don’t forget dessert. Their sorbet flavors are potent yet fluffy – I loved the mango! So try it out. 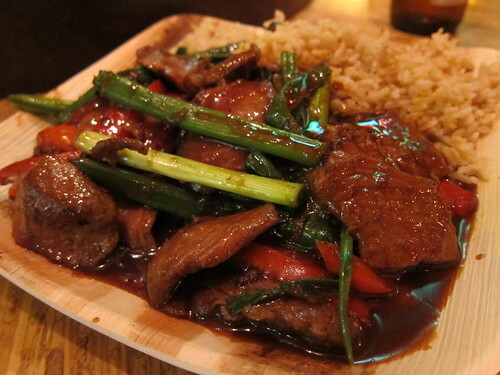 You won’t get that MSG hangover or icky feelingÂ you typicallyÂ getÂ after consuming bad-for-you Chinese. And if you’re looking to get some work done, you might as well bring your laptop, too. All food, wine and beer were hosted. This entry was posted in beer, Food, lunch, West Hollywood, wine and tagged Chinese, Eastern, Fresh East, Fresheast, greens, Indian, Pan-Asian, quinoa, rice, robertson, Santa Monica Blvd, Thai, West Hollywood. Bookmark the permalink.